Don’t be put off by this record’s label – the disc is way different from a pop record. 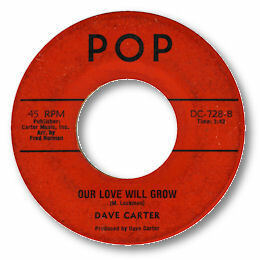 This New York 45 seems to have been a one-off – at any rate I can’t find any other 45s by Dave Carter. But this one is good enough to match several normal releases. Our Love Will Grow is splendid deep soul piece arranged in the grand manner – organ, guitar and horns just as they should be. And over the top Dave uses a series of gospel touches as he sings the lyrics of long term love. Really nice – especially the chord changes. The chugging, bluesy flip isn’t bad either. Note ~ You can find Edwin Johnson's version of "Our love will grow" here.